Danish nobleman Tycho Brahe became interested in astronomy. R. H. Frost discovered asteroid #505 Cava. E. Delporte discovered asteroids #1285 Julietta and #1290 Albertine. E. L. Johnson discovered asteroid #1568 Aisleen. Goethe Link Observatory discovered asteroid #3654. Flying the Douglas D-558-II (No. 2) Skyrocket research aircraft which had been launched from a B-29 Superfortress at an altitude of 34,000 feet, USMC Lt. Col. Marion E. Carl attained an altitude of 83,235 feet above Edwards AFB, California. The first successful Soviet R-7 ICBM was launched, travelled 6,000 km (3,700 mi), and landed in the Pacific Ocean. USSR launched the R-7 M1-8 (I-3) test mission 21 August 1957 which travelled 6,000 km (3,700 mi) and landed in the Pacific Ocean. It was the first launch from Baikonur and the first successful ICBM flight. Problems curing the nose cone material, known before launch, led the dummy warhead to disintegrate over Kamchatka. During the countdown of the first programmed Little Joe launch (LJ-1 beach abort test) at Wallops Island, the escape rocket fired 31 minutes early because of faulty circuitry. The spacecraft rose 2,000 feet and landed 2,000 feet from the launch site. NASA launched the Gemini 5 Earth orbiting mission carrying Gordon Cooper and Pete Conrad, with which the US finally took the manned spaceflight endurance record from Russia, demonstrating the crew could survive zero gravity the length of a Lunar mission. NASA and the USAF launched X-15A-2 Ramjet/Hycon/TPS Test/Imaging mission # 186, the first test with a full ablative coating and ramjet pod, in which Pete Knight reached a maximum speed of 5420 (Mach 4.94) kph and achieved a maximum altitude of 27.737 km. NASA/USAF launched X-15A WTR/HS/SB/FAB/FP Test/Technology/Aeronomy mission # 197, the last high altitude X-15 mission, where Wm. Dana reached a maximum speed of 5541 kph (Mach 4.79), and an altitude of 81.534 km, earning (USAF definition) astronaut wings. NASA launched the Orbiting Astronomical Observatory-3 (Copernicus, OAO 3), the first ultraviolet telescope in space, for UV observations of stellar objects. NASA launched the Orbiting Astronomical Observatory-3, also known as Copernicus or OAO 3, into a nearly circular 7123 km radius orbit, inclined at 35 degrees, on 21 August 1972. The main experiment was an ultraviolet telescope supplied by Princeton University. However, it also contained a cosmic X-ray experiment provided by University College London/MSSL. The main body of Copernicus measured 3 x 2 meters. The solar pannels were fixed at an angle of 34 degrees to the observing axis, and were kept within 30 degrees of the Sun. This restriction resulted in certain parts of the sky being visible only at certain parts of the year. The astronomical instruments were co-aligned, with the UV telescope residing in the central cylinder of the satellite and the X-ray experiment in one of the bays surrounding it. While the UV telescope was observing, the X-ray detectors primarily took background measurements. Occasionally, the X-ray detector observed an X-ray source in the field of view of the UV target. Copernicus operated until February 1981. N. Chernykh discovered asteroid #2439 Ulugbek, #2529 Rockwell Kent, #2671 Abkhazia and #3471. L. Brozek discovered asteroid #3102. T. Schildknecht discovered asteroid #3328. USSR launched the Resurs F-13 landsat from Plesetsk for Earth natural resource investigation in the interests of various branches of the USSR national economy, for solution of environment problems, and for international cooperation. NASA lost contact with Mars Observer (MGCO, Mars Geoscience/Climatology Orbiter) three days before the spacecraft reached Mars. A Pegasus XL launched from an L-1011 carrier aircraft lofted NASA's Fast Auroral SnapshoT Explorer (FAST) satellite into orbit. The Fast Auroral SnapshoT Explorer (FAST) satellite was successfully launched on 21 August 1996 into its intended orbit. FAST investigated the plasma physics of auroral phenomena at extremely high time and spatial resolution using the full complement of particle and fields instruments. FAST was the second spacecraft (SAMPEX was first) in the Small Explorer (SMEX) program at NASA-GSFC (Goddard Space Flight Center). SMEX was established to provide rapid (3 year development) low cost ($35 million development) mission opportunities (1 per year) to the space science community using a single designated Principal Investigator (PI). In order to capture the auroral phenomena over small time (microseconds) and spatial scales, FAST utilized high speed data sampling, a large, fast-loading ("burst") memory, and a smart, on-board software to trigger on the appearance of various key phenomena. Using a 1 Gb solid-state memory and a data acquisition rate of 8 Mbs (almost two orders of magnitude faster than previous satellites), FAST produced high-resolution "snapshots" of auroral arcs and other interesting auroral events. FAST flew in a highly eccentric, near-polar orbit precessing nominally one degree per day. Scientific investigations operated in a campaign mode (about 60 days long) as apogee transitions through the northern auroral zone and in less intense survey mode during the rest of the orbit. The FAST mission used a unique lightweight, orbit-normal spinner spacecraft developed by the SMEX project. 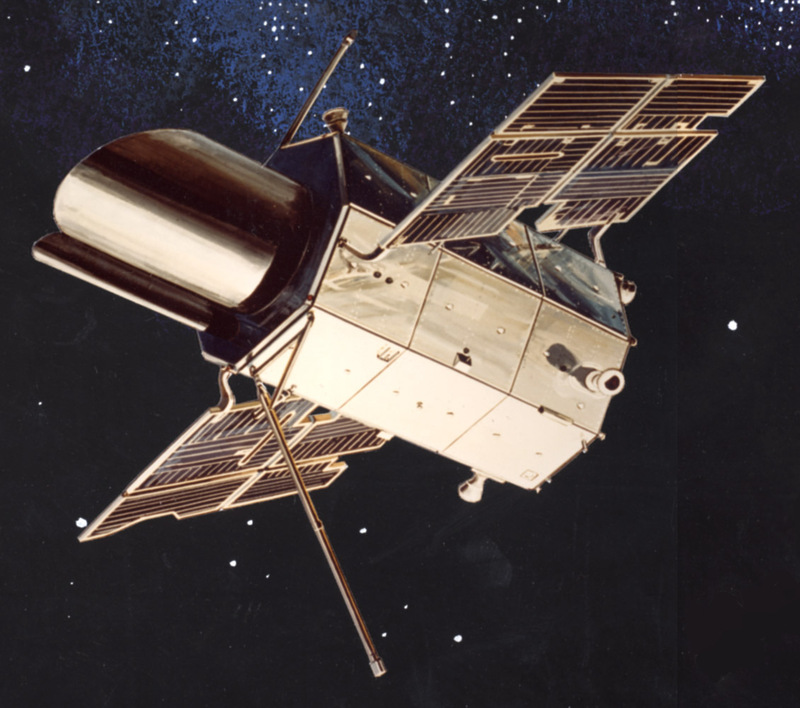 The spacecraft had body-mounted solar arrays, and was spin-stabilized, rotating at 12 rpm with the spin axis normal to the orbit plane ("cartwheel"). The four FAST experiments were: (1) the Electrostatic Analyzers (ESA) for measuring the electron and ion distribution function, (2) the Time-of-flight Energy Angle Mass Spectrograph (TEAMS) for measuring the full 3-dimensional distribution function of the major ion species, (3) the Tri-Axial Fluxgate and Search-coil Magnetometers for measuring magnetic field data, and (4) the Electric Field/Langmuir Probe Instrument for obtaining electric field data and plasma density and temperature. The FAST electric field instrument stopped providing meaningful data around 2002, all other instruments and systems were continue to function nominally as of 20 October 2005. FAST operations ended on 4 May 2009. A Delta booster launched from Vandenburg, California carried five Iridium commercial communication satellites (Iridium 22 through 26) to orbit, which were place in the ascending node of Plane 2. Russia launched the Progress M-45 International Space Station servicing mission from Baikonur, which docked with the ISS at 0951 GMT on 23 August at the aft Zvezda port and delivered 2.5 tons of fuel, water, oxygen, equipment and spare parts. The maiden flight of the Atlas 5 EELV carried the 4.9 ton EUTELSAT Hot Bird 6 geostationary communications spacecraft to orbit to provide digital radio and television coverage to Europe, North Africa, and the Middle East. 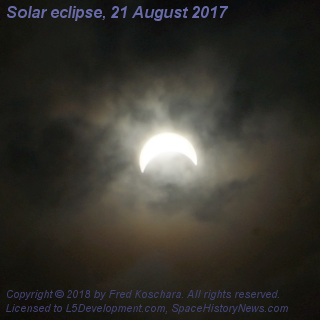 A total solar eclipse was visible following a path across the entire continental United States.